2016 is an election year, so it’s AskThem time. AskThem works as a uniquely open Q&A platform for all the Presidential campaigns, every Congressional race, and more contests in your state. Make a tax-exempt donation today to support our (free & open-source) work on public accountability. Why help support our work? Your gift goes directly to keeping AskThem up and running in 2016. … every Prez candidate, and everyone running to represent you. We’re a tiny non-profit project, and your gift will keep us online during this crazy election year. Charitable foundations and philanthropists – please get in touch to discuss how we can foster greater public dialogue in every Congressional district, all 50 states, and the top 100 U.S. cities. Just email me: david@ppolitics.org. AskThem hasn’t received any charitable funding support since a Knight Foundation prototype grant of $35,000 in 2014. But we’re still online, still publishing new users’ questions, still delivering popular questions for a popular response, and still running grassroots campaigns – for example, for participatory budgeting in cities, to civic tech speakers at conferences, and elected officials nationwide at federal, state, and city levels of government (!). AskThem is different from commercial petition sites and social media services. Because of our non-profit work on open public data, anyone can build even more powerful civic engagement tools. We surface popular sentiment as libre information on the open web, for more open candidate debates and priority-setting; big companies don’t make their content truly open, or help other civic apps innovate. or a consulting contract for open-source web development. I hope you’ll help our public-benefit work continue – it’s going to get real real interesting. We believe AskThem should exist for continual public conversation with people in power. 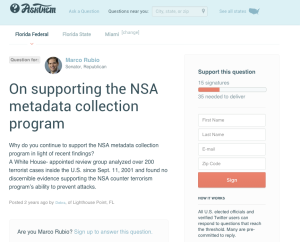 We’re the only version of the White House’s popular “We The People” petition platform – for every elected official, candidate, and more public figures. Our 501(c)3 non-profit, the Participatory Politics Foundation, uses Action Network to accept your tax-exempt donations. Questions, feedback? Email me, I’m easy to reach and eager to talk about how AskThem works uniquely as open infrastructure for engagement. Question for all the candidates-What would you do to stop all the false advertising about everything- i.e. Food, health care, etc.